Dr. Marcus Natta with 2017 scholarship recipients. 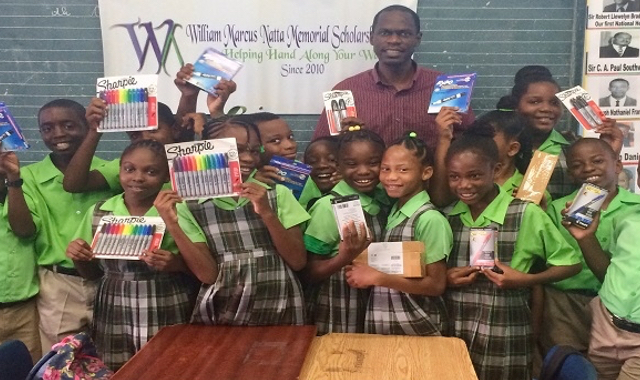 Basseterre, St. Kitts, 11th April, 2018 (MyVueNews.com) – Dr. Marcus Natta of the Natta Memorial Foundation is encouraging persons to attend the scholarship fund raising dinner and help in the expansion of the scholarship fund. The third Annual Scholarship Fund-raiser takes place on Saturday, 14th April, and will have as its featured speaker former Ms. Universe and lawyer Wendy Fitzwilliams, who is described as a multi-talented entrepreneur, a philanthropist, author, TV host and model. Natta recalled that the scholarship fund first started with family and friends making giving donations to the cause of helping young students in need of support for their education. But he indicated the need to expand the fund to assist more students. “What we are trying to do is empower young people. 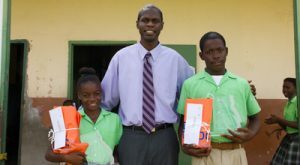 We started with close family and friends giving donations, but our goal and our vision is really to assist all primary schools on St. Kitts and on Nevis. So, we embarked on a public fund-easing effort, and this is just one of the avenues that we are looking at,” Natta explained. For persons attending, Natta said, “You’re are going to be entertained and inspired, but above all, what we are giving is an opportunity to expand the scholarship to reach other students and give them a better chance. We want to give a helping hand to those students who need it,” Natta stated. Top Photo: a group of scholarship winners pose with Dr. Marcus Natta.